The best eating I’ve ever done was at a party where everybody was supposed to bring the best thing they cook. 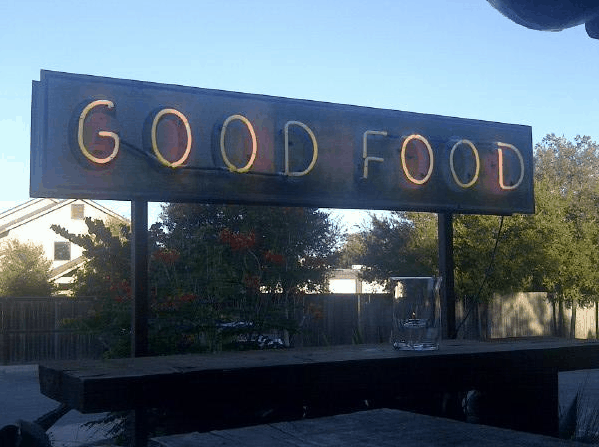 You know, the food that everybody begs you for the recipe. So everybody brought the food that they were famous for and feasted. Blog posts so you don’t have to repeat yourself. One thing you can do with blog posts is to create a repository of things. Like a place to share recipes. Blog posts can also be a spot to do a crowdsourced collection of things. My crowdsourced post on favorite breakfast tacos in Houston is very popular. Sort of a public service that helps me too. I use to have an Irish Whiskey Cake recipe in a blog post at FanHouse, but AOL nuked those old links. That used to be the place I would send friends who were looking for that recipe. Since I have control over this site, this link won’t go away without me knowing it. 1. Share my recipes. I’m going to share three recipes I often get people asking me how to make. They are super easy and taste really good. 2. Asking you to share YOUR famous recipe(s) in this format. Leave a short comment about the recipe, what makes it special, why someone should try it. After that, please leave the recipe or a link to the recipe if you found it online. I want a solid blog post that has only good stuff in it, and I won’t approve blog comments that are a joke or are spam. 3. Also if you try the recipes, leave a comment, and any suggestions if you have them. If you have more than one recipe you want to share, put them in separate comments please. And thank you, because you likely are sending me good recipes if you have more than one people know you for. How to find this later? If you can’t remember how to find this direct link, try googling an assortment of “Stephanie Stradley blog cookbook best recipes” and this should end up being the first link if the googles are doing their job. 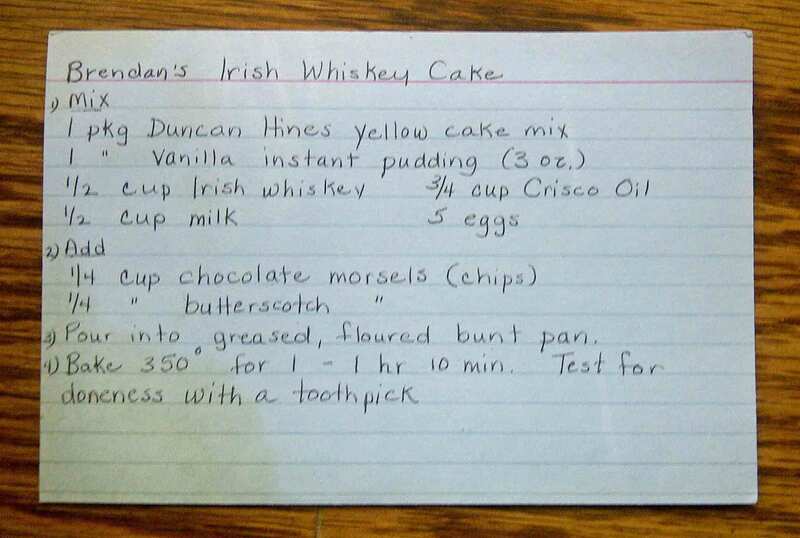 This is my mom’s handwritten index card of the Brendan’s Irish Whiskey Cake recipe. Great handwriting. Glad I still had this because AOL nuked the blog link I put the recipe on. The Story of the Cake. My buddy Brendan gave this recipe to my mom, who then wrote it down on an index card and gave it to me. It is easy to make, looks fancy and is wonderful. The smells delicious and tastes better. This recipe I get asked for all the time. I’ve been known to eat this cake for breakfast too. It is irresistable. 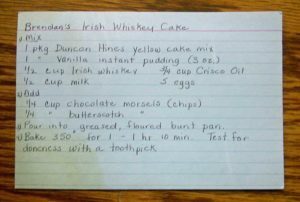 Brendan’s Irish Whiskey Cake Recipe. 1. Preheat oven to 350. Grease and flour a bundt pan. 3. Pour into greased, floured bundt pan. Bake 350 degrees for 50 minutes to an 1 hour depending on how dark your bundt pan are, how hot your oven tends. Test for doneness with a toothpick. After cooling for 10 minutes, put a plate on top of the bundt pan, and carefully turn it over. The cake should fall right out if you greased the pan properly, and didn’t put the morsels too close to the edge of the pan. Sometimes we’ll put four salmon on the smoker at one time. If you are heating up the wood, you might as well cook a bunch. It gets eaten. Salmon salad sandwiches the next day are heavenly too. The Story of the Salmon. One thing that Texas is known for their smoked meats, which is a delicious thing to be known for and reason number 84,589,725 to never move away. My husband Bill bought a custom smoker at Pitts By JJ many years ago and has been very happy with it. Though we love cooking a ton of different stuff on it, my buddy George’s smoked salmon is the best. Even people who don’t typically like salmon, like this. Kids will even eat it straight off the grill. 1. Buy salmon. We buy ours from Costco. Don’t buy the steelhead salmon, buy the other kind. 2. Heat yer smoker. Get your smoker to about 200 to 250 degrees. They like using hickory wood. Do not use mesquite. 3. Moisten cedar planks. You can get cedar planks at most stores. Soak them in water for around 30 minutes. 4. Tin foil boats. Make a boat of heavy duty tinfoil to put salmon in. 5. Lemon juice and season. Use the juice of one to two lemons and squeeze it all over the salmon. Put lots of pepper on top of the salmon to the point that it almost looks like too much. Put sea salt on top, not as much as the pepper. 6. 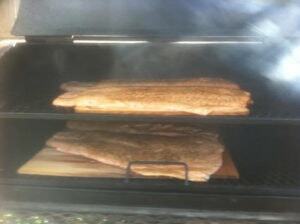 Put salmon on cedar plank then in smoker. First you lift it off of the tin foil and onto the cedar plank. Discard the tin foil boat. Put the thicker part of the fish (the side where they head would have been) toward the smoke source. 7. Cook for 40 minutes to a little over an hour depending on temp, whatever doneness you prefer. Eat it warm or cold, with romaine lettuce boats, pita chips, maybe some herb mayo or plain. The Story of the Muffins. I like muffins, but I don’t like the kind they sell at the store or bakeries that are so sugary they might as well be cake. Bill sometimes loses weight when he goes to trial because he forgets to eat, and these muffins are a great thing to sneak into his briefcase. I like packing some in my carry on stuff on the planes because if I don’t, the plane will certainly be delayed to the point of desperation hunger. These muffins basically have all the ingredients I love in one place. I adopted the recipe from a few I saw otherwise, and made many variations of these since at least 2001. This is the oven at my house. 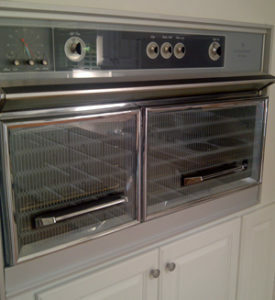 It’s an old Frigidaire that we call “The DeLorean” because the doors open upward. 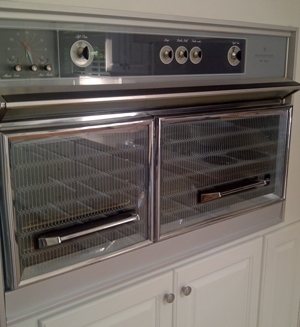 These sort of gull wing doors are nice on an oven because you don’t have to reach over hot doors to get the food in and out. It cooks very true to temperature, likely because it was built when quality mattered. 1. Prep. Preheat oven to 375. Grease muffin tins. When I say to stir stuff in recipe, use a fork. Try to use minimum stirs to mix because over-mixing results in gummy texture when you make muffins. 2. Bowl 1. Put 1 1/4 cup roughcut oatmeal in bowl. Pour 1 1/4 cup milk in bowl with it. Let it soak while you prepare the rest. 3. Bigger Bowl 2. In a bigger bowl, put 1/2 cup brown sugar, 1/2 cup vegetable oil (though I like using walnut oil), 1 egg. Stir. With some fruits, I put a little vanilla and cinnamon in too. Basically whatever you like, whatever you happen to have in the house. I’ve never made this recipe with savories like bacon, but I bet that could be good too. Experiment! 5. Combine. Then dump oatmeal, milk mixture into the larger bowl and stir. In a measuring cup put 1 1/4 cups flour. Put 1 teaspoon baking powder in flour and just sort of mix that in the flour measuring cup. Then slowly dump flour into the big bowl that has the other stuff and mix (VERY IMPORTANT NOT TO OVERMIX THIS STEP). Stop pouring flour when it looks the consistency of raw muffin batter–not too runny, not too thick–I’d rather have it slightly too wet than too thick–the oatmeal is fairly dense. This step isn’t exact because of the quantity of mixins or whether you are using a more moist mix in like bananas. Sometimes I use all the flour. Sometimes I use about a cup. 6. Cook for 20 minutes. My oven cooks these perfectly in 20 minutes. Your oven may be different. You just want them to look brownish on top. If you use moist ingredients like raspberries or blueberries, they may bubble a lot and may take a little extra time to cook. 7. You will eat one more muffin than you planned. Let the cool for a bit and then pop out. Sometimes you need to run a knife around the edges if they are sticking. Please Add to My Blog Cookbook. If you try the recipes, please let me know in the comments and provide any questions or suggestions. And please, add your best recipe to this post, or a link to your go to recipe. Bonus points if it is easy to make but doesn’t look that way. Easy to make shrimp / avocado salsa. Buy bag of peeled, cooked, frozen, tail on shrimp (any size). Run water over them to slightly defrost enough to chop into small pieces (about 3 – 4 pieces per shrimp). Add shrimp to 2 jars Arriba Roasted Red Pepper Salsa (I use one jar of mild and one of medium). Optional to add garlic salt or fresh garlic. Let sit over night. Add 2 diced ripe avocados and lime juice to taste. Serve with tortilla chips. Everyone loves it!